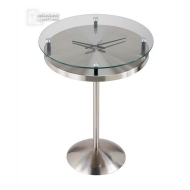 While I was browsing through the store looking for unique pieces of furniture for my living room, I came across this fabulous end table. I love the contemporary look, sleek lines and the chrome finish. This table would look great in the room because it will be placed in a tight corner and it gives a spacious feeling. I was looking for a way to bring some sparkle or shine into my room and this is perfect. Find it in the new American & International Designs Inc Store.